It's great fun, it does an amazing impression of the real thing (you even get all the factory presets), and we just can't get enough of it. Great price. Sounds like the original. Hard to put down. A few GUI and adjustment gripes. Arturia's third iPad synth is an emulation of Sequential Circuits' 80s classic, the Prophet VS. The first synthesiser to employ vector synthesis, the VS featured a joystick for mixing between its four wavetable oscillators - a core architectural element that's fully replicated on iProphet, along with an 'Envelope Mixer' for automating its movement. The 95 waveforms available to each oscillator constitute a great range of base textures from which to construct the sorts of edgy, elaborate pads, leads and bass sounds that made the original so sought-after, while the multimode filter brings a touch of analogue refinement to an otherwise decidedly digital vocabulary. "An intuitive pin-style modulation matrix makes assigning mod sources and destinations easy"
Handily, the filter and amp envelopes can be expanded to an interactive graphical view, and each of the synth's eight voices can be panned independently. An intuitive pin-style modulation matrix makes assigning mod sources and destinations easy, the former comprising the aforementioned envelopes, two LFOs, velocity and mod wheel, and the iPad accelerometer (X and Y axes), and the latter including all four oscillator frequencies, and oscillator A/C and B/D mix. Of course, Core MIDI, IAA and Audiobus are all supported, as is Tabletop (developed by Retronyms, who also had a hand in iProphet itself), making iProphet as versatile and controllable as an iOS synth can currently be. 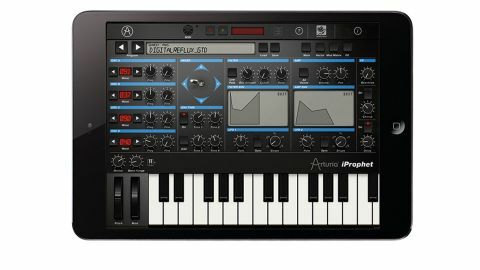 It can also exchange patches with Arturia's Prophet V on Mac or PC. We have a few criticisms, though: the joystick would be better placed on the edge of the Main GUI, where it could be more easily reached with the thumb when used handheld rather than on a table; and we'd love to be able to modulate the waveform selection for each oscillator, and adjust mod depths per assignment rather than per source. Other than that, this is a brilliant virtualisation of a timeless synth at a silly price.